Harriet Lewis was born in 1951 in Philadelphia, Pennsylvania of God fearing Jamaican parents. She began singing in her local Baptist Church when she was 12 and became the director of their Baptist choir who travelled throughout Philadelphia. She later formed a junior choir of her own with the help of her mother consisting of children between the ages of 5 and 17. They performed concerts throughout the Eastern coastal region of the US singing a cappella vocal arrangements by Harriet. She received her first formal training at Sherwood Recreation Centre in Philly and here she studied dance including ballet, tap, modern jazz, African and modelling and it was here that she began to incorporate dance styles into her vocal performances winning many local talent competitions. In 1967 Harriet became one of the founder members of the Philadelphia International Records recording group �The Forget Me Knots� and it was with this label that she recorded background vocals with Pattie Labelle, Billy Paul, The O Jay�s, Prince Charles� main squeeze The Three Degrees, The Intruders, The Del Phonics, The Four Tops, the wonderful Harold Melvin and The Blue Notes, the terrific Donald Byrd, etc etc; It was with the latter group that she eventually moved to the famous Blue Note label to work on background tracks for Blue Note, Gold Production and Sal Soul Orchestra. After completing Voice and Music Theory at the Philadelphia Music Academy Harriet signed on for a two-year road tour with Philly groove artists �Raw Image�. In 1973 Harriet formed her own band �POSH�, which soon became recognised as one of the foremost bands in Philadelphia. When she arrived in Stuttgart, Germany she worked the nightclub and hotel circuits and was soon in demand by some of Germany�s elite jazz and blues musicians. 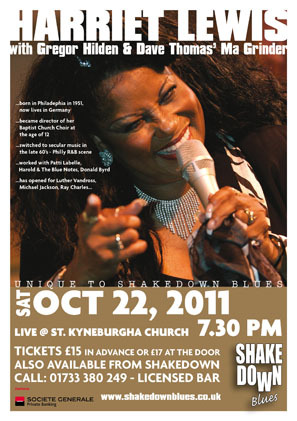 She has opened for Luther Vandross, Eric Clapton, Mariah Carey, Michael Jackson, Ray Charles and many others. From a cappella, gospel to full-blown jazz orchestra�s Harriet has done it all.